Mastering the implementation and management of a Service Management System (SMS) based on ISO 20000. This five-day intensive course enables the participants to develop the necessary expertise to support an organization in implementing and managing a Service Management System as specified in ISO/IEC 20000-1. Also, the participants will gain a thorough understanding of in best practices for planning and implementing the Service Management processes starting from the fields of ISO 20000 planning and implementing new and changed services, service delivery process, relationship management processes, problem resolution process, control processes and release processes. This training is consistent with the project management practices established in ISO 10006 (Quality Management Systems - Guidelines for Quality Management in Projects). This training is fully compatible with ISO 20000-2 (Guidelines for the Implementation of an SMS) and ITIL. 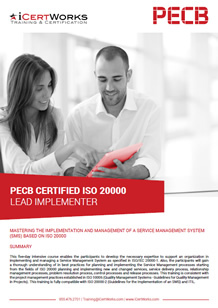 Contact us about ISO 20000 Lead Implementer Training!